When business owners worry that they are perceived as being the same as all their competitors, it’s a clue that they are telling someone else’s story and not their own. No one else can have the same story as you do – it’s impossible. We are all unique – the combination of thoughts, experiences, and backgrounds we have are our own. Even if you grew up in the same place, same family, even if you have an identical twin and you now own identical businesses (highly unlikely, I would guess), your stories are different. Somewhere in your story, perhaps hidden or perhaps shining brightly, is your “why.” This is often the part of our story that we fail to communicate, and it is usually what makes your business different than any other. 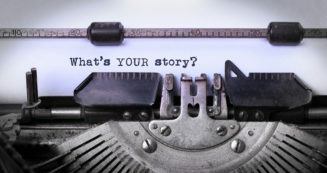 Your why, blended with all the other facets of your what, where, how, and who, gives you the ingredients for a story that allows potential customers to understand exactly who you are and whether or not it is a fit to work with you. Your story is the magnet that attracts others to your organization and lets them know they are aligned with your purpose.